The Classic Industries Tri Five Chevy parts catalog has an extensive selection of restoration, performance, and customization parts and accessories exclusively for your Tri Five Chevy models including virtually everything needed to restore or modify a 1955-1957 Chevy. Enter the Promo Code - C73TF - at checkout on the Tri-Five Chevy from Classic Industries website. You could build a brand new Tri Five Chevrolet from the ground up entirely with the products offered in their parts catalog: body, frame, engine, suspension and all! That's why Classic Industries is the best source for Bel Air, 210, 150, or Nomad parts. Power - GM Performance engines, ignition, radiators, shifters, clutch components, tuning modifications, exhaust systems, fuel pumps, carburetors and more! Performance - Enjoy peak performance with the Tri Five Chevy parts selection of suspension packages, control arms, sub frames, coil springs, shocks, sway bars, strut braces, brake packages, disc brake conversions, stainless brake lines, and more! Style - Sheet metal, spoilers, bumpers, lamps, trunk, valance panels, grills, trim pieces, weather-strip, molding, exterior emblems, body decals and more! 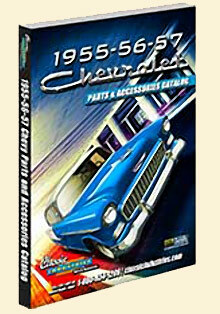 The Tri Five Chevy parts catalog from Classic Industries delivers more than just restoration parts. Thanks to their friendly and knowledgeable staff, their expert pit crew will always be ready to provide you with the parts and answers you need, when you need them, and the technical support you'll need to get through every step of your restoration project.